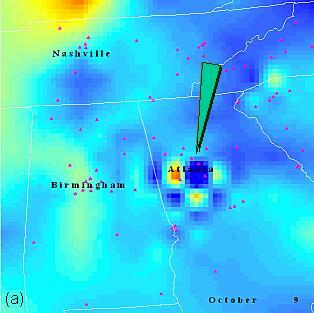 A quality control (QC) procedure for eliminating spurious measurements of PM2.5 from a network of ground observations has been developed by the team from NASA/MSFC participating in the HELIX-Atlanta Respiratory Health Team led by the CDC. The procedure utilizes observations from surrounding sites to determine whether a given measurement is acceptable or is considered erroneous and thus eliminated from further analysis. The QC procedure is based on a non-parametric (rank-order) spatial analysis. This method does not make the assumptions often present when using parametric statistics. The CNS is used to filter the raw data using the following criteria: The test station will be dropped out of the data set if ALL the five closest neighbors have values larger than the CNS times the test observation, OR ALL the five closest neighbors have values smaller than the inverse of CNS times the test observation. An exception for the first part of the rule would be if one of the five neighbors has a value that is so small compared to the rest of the other neighbors (i.e. smaller than the inverse of CNS times the smallest value of the other neighbors); and an exception for the second part of the rule would be if one of the five neighbors has a value that is so large compared to the rest of the other neighbors (i.e. larger than the CNS times the highest value of the other neighbors). 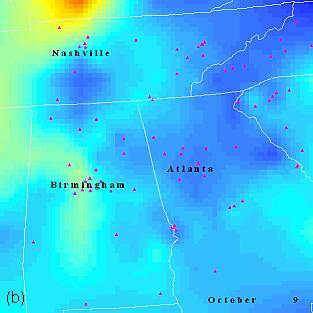 The filtered EPA AQS observations have then been used to generate spatially continuous ground-level PM2.5 surfaces in order to estimate exposure to the local population using the B-Spline surfacing technique. Figure 3 shows an example how using the quality control procedure enhanced the output PM2.5 surfaces by preventing any unrealistic ripples to be formed within the surface. The location of the wild value is indicated by the green arrow. Data are from the EPA AQ network for October 9, 2003.